SockIt! is designed from the ground up to improve healing of all oral wound and virtually eliminate postoperative discomfort. Manufactured by MCMP, SockIt! Oral Hydrogel Wound Dressing is drug-free, all-natural, and it is approved by the FDA for application to all oral wounds. SockIt! provides fast pain relief and promotes optimal healing, and it is ideal with tooth extractions, grafts, implants, SRP, laser procedures, ulcers, lesions, or injuries to the mouth. SockIt! can be applied in the office and sent home with the patient for use as often as needed. SockIt! consists entirely of food ingredients, with no artificial ingredients or narcotics. SockIt! contains mannose polysaccharides from aloe vera, xylitol, as well as essential oils of cinnamon, clove, and thyme. It is the best. No drugs, no numbing. It is expensive, but well worth it. 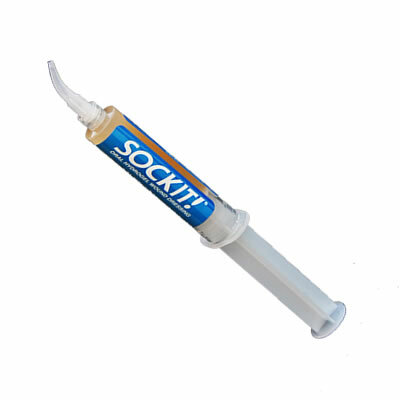 Have recently started using this product on all surgical extractiion cases at our prison in Kingman,AZ. Heard about this product at Western Regional Dental Conference March 2013. Higher than normal dry socket rates due to inmates smoking and not following directions. Have not seen one dry socket in the cases we have used it on. Not allowing inmates to take syringe back with them, just fill socket as teeth are extracted and/or after suturing and suctioning extraction site. Have given some syringes to local oral surgeon to try. We are an oral surgery practice with a high volume of 3rd molar surgery. I am a dentist and I work with my husband who is the oral surgeon. We give this to all our patients with their post-op instructions. We have been handing them out for almost two years. At every post-op evaluation, I ask how they liked it. It is really hit and miss. Mostly, it's not well received. Many, and I mean many, patients dislike the flavor of the gel. Expressions are "yuck" and it then goes to waste because they don't use it. Most patients are teenagers, so taste is important. We also get those who use it-because the parent insists, and they have good results. I have only had a few such responses. And there are those patients who say it was OK, did not help one way or the other. We don't charge for this product, so it is an expensive item which does not give back 100% in patient satisfaction. We have no plans to discontinue this product, but I keep searching for a less expensive and better tasting product. There is nothing out there, yet. Disappointing.